Moldex Comets® Reusable ear plugs are the first reusable earplug to feature an innovative "finger fit" that allows the user to easily guide the earplug directly into their ear canal, for a simple, easy insertion. For Motorcyclists: The No-Stem design also means Moldex Comets are a terrific reusable ear plug for motorcyclists and others who need to wear an ear plug under a helmet. Moldex Comets® feature a triple flange design that provides maximum comfort, even when worn for extended periods. Hearing protection at your fingertips. User friendly finger pocket makes Comets® easy to insert. Extra soft material and an air-cushioned tip provide all-day comfort. Soft triple flange adjusts to most size ear canals to hold the plug securely in place. Moldex Comets Reusable Ear Plugs (NRR 25)3Harry DrakeJuly 8, 2018The last time i purchased these there was an option fro a stem out of the end. I cut the stem shorter and they fit into my full face helmet and were easy to remove. Without the stem i am having a difficult time trying to remove them. Moldex Comets Reusable Ear Plugs (NRR 25)5Gracia D BleesJanuary 3, 2018These have changed my life. I thought that it was my snoring husband that was upsetting my sleep, and after I began to use these earplugs I found out to my horror that I also make "sleeping sounds"! Thank you so much for this great product. I sleep so much better now. Moldex Comets Reusable Ear Plugs (NRR 25)5SophiaDecember 1, 2017Great to have in a dorm on a weekend you need to study! Super comfy, especially once broken in. Moldex Comets Reusable Ear Plugs (NRR 25)4AmyOctober 15, 2017I bought these because I wanted reusable ones for while I sleep - they're pretty good at keeping out noise and while they tend to fall out during the night it doesn't bother me much. I like these better than some other orange ones I bought from this site before. Moldex Comets Reusable Ear Plugs (NRR 25)3VickieNovember 3, 2016These are pretty comfortable and are OK for blocking noise. I was hoping to find something I could use for sleeping. I'm a side sleeper, and these hurt my ears. I can't use them at all for sleeping. Moldex Comets Reusable Ear Plugs (NRR 25)5CDucAugust 24, 2016I sleep in them they work great! Moldex Comets Reusable Ear Plugs (NRR 25)5SMarch 4, 2016Great for all day use, really comfortable, you can hear conversation but background noise disappears. Moldex Comets Reusable Ear Plugs (NRR 25)5RonDecember 16, 2015ONLY ear plug I have ever had that I can wear all night. Work great while riding motorcycle. Last a long time. I store them in 5% hydrogen peroxide between uses. Keeps them clean and makes them very easy to insert. Moldex Comets Reusable Ear Plugs (NRR 25)5DonSeptember 23, 2015My second purchase of these earplugs. Primary use is motorcycling. They keep the wind noise down to a comfortable level and I can wear them for hours without discomfort. Easy to clean for extended use. Don't harden over time. I also use them for air travel and occasionally for sleeping (in a bunk house or in the spring when the birds make an unbearable racket at 4AM). Moldex Comets Reusable Ear Plugs (NRR 25)5Mister WymanJuly 26, 2015These are great for sleeping - they have no extrusion on the base. The recessed base doesn't protrude like many earplugs, so they don't jam into your ear against the pillow. Moldex Comets Reusable Ear Plugs (NRR 25)5Bob tJuly 1, 2015Perfect. Blocks sound does not hurt ears As many others do. I Have tried a few dozen ear pluge and these are by far the very best. Moldex Comets Reusable Ear Plugs (NRR 25)5RonJune 3, 2015Still my favorite plug. I've tried a lot of plugs but for me these work the best. I ordered some Moldex Flip to Listen Dual Mode Ear Plug at the same time I orded these. I like these much better and they are considerably cheaper. Moldex Comets Reusable Ear Plugs (NRR 25)4VanessaFebruary 4, 2015When I used them, they didn't block out noise 100%. I could still hear traffic, but the noise was reduced, so I would say they work. They go deep into the ear, so it feels a bit weird, but you get used to it. They definitely helped me sleep. Moldex Comets Reusable Ear Plugs (NRR 25)5chrisFebruary 2, 2015I bought these for when I ride my motorcycle. Great for wearing all day as it does not fatigue your ears. Goes on with ease and can I can barely feel it with my helmet on. Moldex Comets Reusable Ear Plugs (NRR 25)5Marisa W.March 27, 2014I prefer plastic over foam ear plugs mainly because plastic ear plugs are easier to wash. These Moldex Comets are by far my favorite. They flush nicely to my ears so when I sleep with them - there is no stem bending against my pillow. This is the second time I have ordered a good supply, and I plan to be a repeat customer since I can never find a better price or product in local stores. Moldex Comets Reusable Ear Plugs (NRR 25)5CharlesDecember 23, 2013I like them. Soft and easy to insert. NRR 25 is enough what what I will use them for. Good product. Moldex Comets Reusable Ear Plugs (NRR 25)3CarolynNovember 6, 2013As others have said, I found them to be too long, and they press against the inside of my ear. I can't sleep on my side with them for that reason, but they're usable for regular daytime wear, as long as nothing else presses against them. Moldex Comets Reusable Ear Plugs (NRR 25)1manuelOctober 16, 2013no suction,did not block noise!! would not recommend or buy again!! Moldex Comets Reusable Ear Plugs (NRR 25)5markOctober 14, 2013They are great for under a helmet as they do not pop out while pulling the helmet on. Moldex Comets Reusable Ear Plugs (NRR 25)4ElaineOctober 12, 2013I've tried a lot of ear plugs over the years, and Moldex Comets are the easiest to properly insert that I've ever come across. The noise attenuation is pretty good but not so significant you can't converse with these in. The one flaw, however, that keeps these from being my perfect ear plugs is that they tend to become somewhat uncomfortable in my smaller than average ear canals after an hour or two. They are fine for short periods of time, but I wouldn't want to wear them all day or sleep in them. Moldex Comets Reusable Ear Plugs (NRR 25)4StanSeptember 7, 2013Very good at blocking sound, but in one ear I have to jam them in so far that they hurt a little. Still though, great at blocking sound. I sleep with them. Moldex Comets Reusable Ear Plugs (NRR 25)1sharpAugust 21, 2013they were too long. three flanges would have been better and wouldn't hit the inside of my ear. I did find two others types of ear plugs that sealed better and didn't hit the inside of my ear. Moldex Comets Reusable Ear Plugs (NRR 25)5Ron MooreJuly 10, 2013Of the three pairs of earplugs I bought, these were by far the best. They create a good seal, they keep the noise out, and they don't fall out while riding my motorcycle. These work the best for me and they were by far the cheapest, wouldn't suggest getting anything else. Moldex Comets Reusable Ear Plugs (NRR 25)5KimJuly 8, 2013An excellent product. Very comfortable and effective. Moldex Comets Reusable Ear Plugs (NRR 25)5ChrisJune 4, 2013These Moldex Comets work great for a snorring husband! I cannot hear him at all and the way these fit in my ears they dont poke or hurt me when I lay down. These are great!!! I highly recommend! Moldex Comets Reusable Ear Plugs (NRR 25)4BuddyMay 25, 2013These earplugs are quick to put in and seal well. However I bought them to wear while riding my motorcycle (they were listed in the MC category) and they are uncomfortable for me under my helmet and hurt after a long ride. After trying several types, the extra soft foam plugs seem to work best for me under a helmet. The harder foam plugs are OK if I cut the ends off. Moldex Comets Reusable Ear Plugs (NRR 25)3Tim PalmerNovember 23, 2012Comfort - 5 stars Sound suppression - 5 stars Easy to put in....... IMPOSSIBLE to get out, the first time I used them I thought I was going to need help to remove them. They create a seal in my ears which means they work GREAT at suppressing sound... just a bit scary trying to remove them. Moldex Comets Reusable Ear Plugs (NRR 25)5davidOctober 30, 2012my girlfriend is a drummer in 2 garage punk bands and alot of our friends are in bands. we are at shows alot-we need to save our hearing. we have used them in small punk clubs as well as house of blues when we saw social distortion-always saves me from ringing ears. i keep 2 pairs and it is the best investment i have made. even just bought her a pair she does not have issues when she wakes up now. amazing! perfect! and fantastic! Moldex Comets Reusable Ear Plugs (NRR 25)5Dan HammackOctober 15, 2012Some reviewers here write that these are not good for small ears, but I disagree. I recently had custom molds made because I have a seriously hard time with ear plugs, especially my left ear. The audiologist told me I have tiny ear canals and my left ear canal makes a hard turn. I ride a motorcycle with other riders who don't wear earplugs so I got custom molds so I could just pop them in and go as I always felt rushed rolling up foam plugs, and never seemed to get a good seal anyway. These are awesome and are what I have been looking for for a long time. Fit almost as easily as my custom molds and actually stay put better, my helmet doesn't pull them out as it does my left custom sometimes. I suspect the people saying they don't fit their tiny ears are not pulling their ears up to insert the plugs properly, because I have no problem fitting these, I use my thumb, instead of index finger to finish inserting them so I can push them in easier and nothing sticks out to bother you while wearing a helmet. I will no longer buy customs, just these, cheaper, no left and right to pay attention to, and if you lose one no big deal just grab another. Moldex Comets Reusable Ear Plugs (NRR 25)3John SinclairOctober 18, 2011Unfortunately, for me these didn't work. I cannot get any of these foam earplugs into my ear. I follow the directions, but it doesn't matter, they just fall out. I bought these, thinking they were rubberized, but they turned out to be foam, same problem I always have. Moldex Comets Reusable Ear Plugs (NRR 25)5GillOctober 10, 2011Love the ease of inserting and they do the job. Moldex Comets Reusable Ear Plugs (NRR 25)5sandyJune 27, 2011I use them when mothey orcycle riding. They are great. Easy to put in and take out. 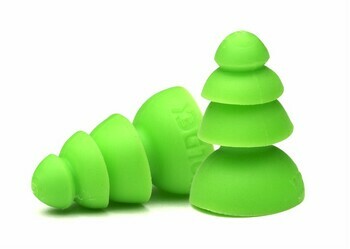 Moldex Comets Reusable Ear Plugs (NRR 25)3NicoleFebruary 22, 2011These are good for bigger ears. They just stuck out of my small, adult female ear canals. I could see the design working if they fit in properly. Moldex Comets Reusable Ear Plugs (NRR 25)5AlexFebruary 13, 2011Good fit for larger ears. Good protection. A good compromise for hearing protection while on my motorcycle while allowing me to hear my intercom speakers in my helmet. They are "firmer" than others and you can feel it when you take them out. That said, they are very comfortable while wearing.